On a summer Sunday a sailing friend of mine suggested we take our families for a spin on the Hamble River on his motor boat (he is a sailing friend converted). With 440hp on the back, once out of the Itchen River we went at speed down Southampton Water passing various cruiser-racers ambling up and down the channel under sail. I felt slightly traitorous, what with all the dirty looks. But I could see my friend’s point if you want to get from A to do something at B. The kids, of course, loved it, but the fun part for the oldies really began at the entrance to the Hamble River as we throttled back to the required six knots. Gee, we passed the very spot where, embarrassingly, we ran the Whitbread maxi Drum aground on the south bank in 1985 . . . It was one of those magical sunny days on the river, with little or no breeze, but enough zephyrs for fleets of dinghies to make way, washing the Warsash and Hamble village river banks in kaleidoscopes of colour. My kids have been to the Hamble on previous visits, but it was their first time afloat here, if you don’t count the public jetty where crabbing was the main activity. I reflected that the last time I was actually on the river – and not in a pub by the river – was more than 20 years ago. The memories came back with each passing feature: the Royal Southern Yacht Club; Simon Le Bon caught with a barmaid from the King & Queen in his room – tabloid field day; the jetty at Port Hamble where I brought Drum alongside the maxi Côte d’Or under sail after we blew off our propeller in the Solent. 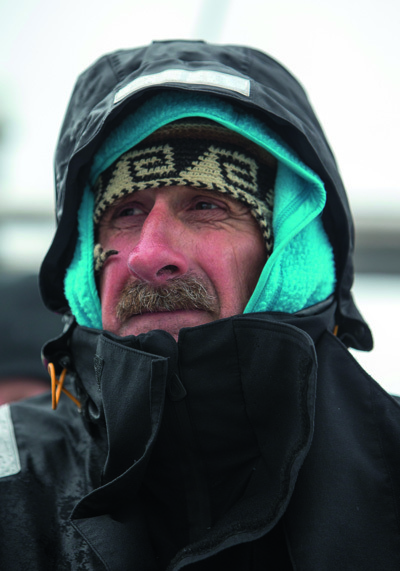 Skipper Eric Tabarly, a man of few words at the best of times, gave his nod of approval as we glided to a halt safely alongside – one of those grand moments. Hamble Yacht Services was the sailing base for Drum in the 1985 Whitbread, and then Fazisi in 1989. Our engaging Soviet crew became a focal point of amusement and bemusement for the locals. I will never forget paying off all our creditors from a suitcase full of cash in the Portacabin on the hard, just before the start. The memories came back with each passing feature: the Royal Southern Yacht Club; Simon Le Bon caught with a barmaid in his room – tabloid field day . . . I used to kayak up and down the river to work at Moody’s. On this sunny day kayaks were out in force, along with all manner of floating objects old and new, in repair and disrepair, rowed, paddled, sailed and motored, all with contented folk picnicking away. Of course, the fairway is much narrower than 20 years ago as marinas have gobbled up river bank space so the flotilla jockeyed for position while working up and downtide. It was right out of Jerome K. Jerome’s Three Men in a Boat, edition 2014. At the bend in the river I could just make out the Old Ship, the Drum crew’s local pub. Photographer Rick Tomlinson and I once jumped out of the second storey window there as the morning work whistle blew. It had been a mega ‘lock-in’ even outlasting the publican. Not much was accomplished by either of us that day. I regularly trawled for old parts and fittings when building Pelagic in 1987. Finally, north of the M27 we found open river and some solitude. We took high water at the creek that leads to Curbridge and the Horse and Jockey. After kayaking up on a rising tide on one of those misty winter mornings long ago, a pub lunch ended in a desperate struggle covered in mud trying to get back afloat late in the afternoon, tide down and several pints accounted for.